Our home was built in 2001 with a modern day flair & all the comforts of a home. Parowan has a small, quaint town appeal that offers something for everyone. At around 6000 ft Parowan is a great place to stay for skiers who have altitude problems who just want to ski in Brian Head resort. Our home is a block from Hwy 143 to Brian Head Ski Resort & all the tourist attractions your heart desires. There are 3 Bedrooms, with 1 Queen Bed in two Bedrooms & 1 Full Bed in the third Bedroom.There are 2 Full Baths, one on each floor. Upstairs a Living, dining & kitchen that opens to a 360 degree view of gorgeous sunrises & sunsets. There is a Pool table & assorted Board Games for your entertainment. Also included is a 40" flat screen TV, DVD player w/ a collection of movie DVDs. Outside our door is access to sledging, atv -bike & horse trails. Public Park & swimming pool also a block away. This is the place the deer & antelope play, often in our back yard! A town with wide open spaces that wont fence you in. Come be our guest anytime. We would love to be your host again and again. Thank you. Hi, Welcome to our home! I was born in southern Utah and grew up in Brian Head & Parowan. No matter where my travels or work takes me, I always look forward to returning home to wonderful Parowan. I enjoy playing the guitar & keyboard, having played in a band for much of my college years. I am the Executive Chef for a restaurant in Las Vegas,NV As a culinary Intern I participated in catering for major events/shows/concerts held in LV including The Rolling Stones, Lady Gaga, Beach Boys, Aerosmith, country singers & more. Parowan is my home town, I love to take a break from the fast-hectic paced life of Las Vegas whenever I can & come home to relax, chill, unwind & just enjoy the magic views of mountains, wide open spaces and freedom. A place where memories and good times have a lasting impression on all my guests. Our home is surrounded with amazing views and trails, yet is only three blocks to Main street where the hustle and bustle of restaurants and antique stores beckons the traveler to enjoy local hospitality, love, kindness and good stories of old pioneer days. Main street has gas stations, banks, post office, laundromat, gyms, massage therapy & much more. Main Street is just 3 blocks from our home, with all the amenities your heart desires - restaurants, stores, gas. parks, museum, library, banks, post office, laundromat, gym, massage therapy & more. Brian Head Ski resort is just 10 miles from our home,on Hwy 143 a block away. For those with high altitude- breathing problems, Parowan is a great place to stay at- after a long day of skiing! There is plenty of Parking within the property.There is NO garage access. Please avoid parking on the side of the road especially in winter as city snow plows need access to clear roadways. Thank you. Because we have a staircase to the 2nd floor, no kids under 5 or crawling babies allowed as we do Not have a baby gate @ our staircase. We are Not responsible for any accidents. Thank you. We always strive to improve & better our home for our customers. I have since changed my cleaning staff & on inspection, I am truly pleased with their excellent performance & attention to minor details. My caretaker will continue to enforce these standards at all times. I took my family for a weekend getaway to see some snow. 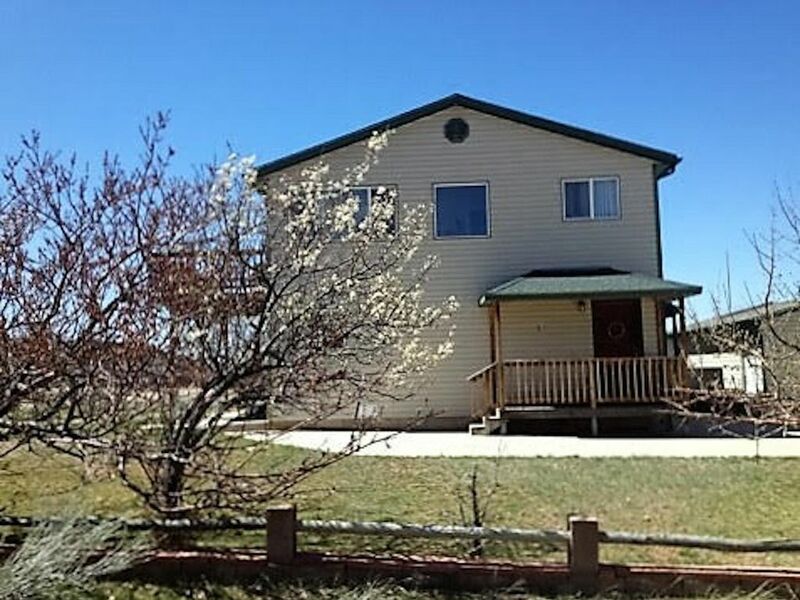 Convenient location right between Cedar City and Brian Head. The house had everything you need (Kitchen, Pool Table, Wifi, Great view to enjoy your morning coffee). The owner (David) was very gracious and emailed us on Saturday saying we could checkout late at 3:00 PM Sunday. We would definitely stay there again. Thank You Brian for being our guest at Parowan Sunrise. We rented this spacious two-story 3 bedroom, 2 bath unit for our week-long Brian Head ski vacation. The rental is located on a edge of town making it quiet and providing a pleasant view of the countryside. It is well furnished for our home-away-from-home needs including cooking and the owner was gracious enough to allow us the use of the washer and dryer so we didn't have to pack as many clothes. The heating worked well to keep us warm and the rental included niceties such as wireless Internet access, flat screen TV, DVD player, concrete driveway parking, a sled for playing in the snow and a pool table. Family pictures of the owner's family allowed us a peek into their lives. Both the owner and his caretaker were gracious and responsive to our needs and requests. That being said, though the hall floors were upgraded and all the appliances worked well, the rental definitely shows its age. Many of the light fixtures in the bathrooms seem to be missing or have a burnt out bulb making the lighting poor. Most of the knobs on the washer were missing and the toilet seat on the upstairs toilet is nearing the end of life. Some of the mini-blind curtain rods were missing making it difficult to close them by hand. Overall, we did enjoy our time in this rental and it was adequate for our needs during our stay. Thank you Caleb for your very positive review/stay at our home. We sincerely appreciated you & your family's visit too. Also, thank you for feed back on what can make our home even more inviting. and upgraded our curtain rods, toilet seat & washer knobs. We look forward to your future visits. Perfect house for our weekend getaway. Location of the house was perfect and easy to get to. Had everything we needed and more. Will definitely be staying here again on our next trip. Our home is just one block from Hwy 143, & Brian Head is 10 miles. Other attractions from 5 minutes to a three hour drive include Petroglyph, National Parks, Zion, Bryce Canyon, Cedar Breaks, Grand Canyon, Old Rock Church and Heritage Park & public Swimming pool.